Boston Lovers show your pride. This bracelet has 3 of your sports team charms and a Boston Strong charm with Swarovski crystals. 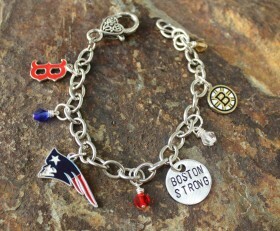 You can change the Boston Strong charm for a I Love Boston charm. Select at checkout. Categories: Baseball, Bracelets, Ice Hockey, NFL, Places & Travel Lovers Jewelry, Shop, Sports.